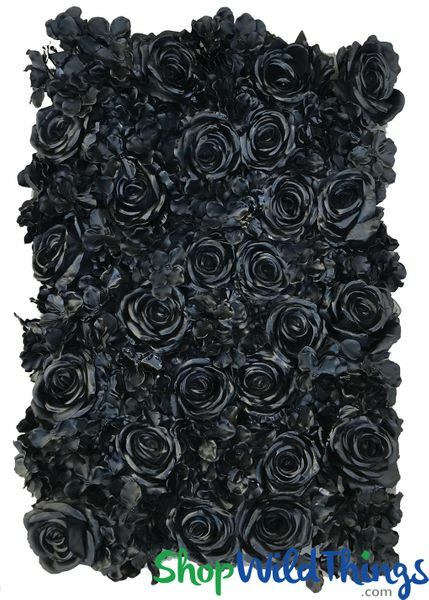 Black Roses & Hydrangeas Flower Wall Panel - Artificial Super-Premium Silk Flower Mat. Snap together frames � easily add pops of color with sprigs of real or artificial flowers and greenery! If you've been looking for a dramatic backdrop like no other then check out this Black Flower Wall! it's classy, elegant and oh, so unique! *The plastic frame is 15 1/2" by 23" but the flowers extend over the edges making the actual measurement about 20" by 27" and it is 3" deep! This novel flower wall is downright captivating and it could actually be considered a piece of 3-D art! This flower wall features huge flowers - 4" in diameter Roses and 2 1/2" in diameter Hydrangeas and the visual depth and dimension of each flower is stunning. The look is semi-shiny which adds a ton of visual interest and intrigue. Black pairs beautifully with every color so combine with other flower walls to match your event theme or cut the black mat into wide strips to outline a wall. This mat only weighs about 1 lb. 4 oz. which allows for many display possibilities. 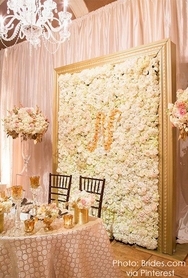 This is an in-house custom flower wall that we paint so please allow an extra 5 business days to complete your order. Our skilled fabricators spend hours producing the rich colors on these extraordinary walls that are ideal for a flat, even application. 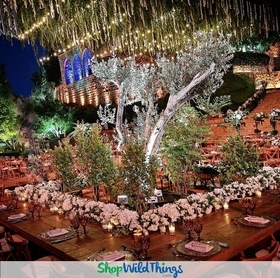 Since the walls are flexible, bending or wrapping around columns and poles may separate the flowers and expose the mat itself as well as the original colors on the very underside of the flowers. The flowers are attached to a sturdy, plastic grid frame that is completely flexible. Two sides of the frame have plastic pegs which insert into the holes on the other two sides of the frame so you can attach as many mats as you need to cover areas small or large. The flowers extend over the edge of the mat so the grid is very well hidden. The grids are an inch square which makes it super easy to work with for attaching the frame to another surface. We'd recommend floral wire or wire ties as an extra measure for keeping them secure or simply staple-gun it to a solid surface. 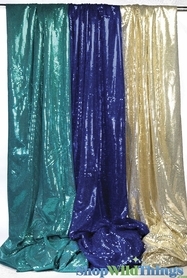 Perfect for black tie events, anniversaries and weddings, attach Dazzling Rhinestone Encrusted Sayings and use the backdrop for a photo shoot. 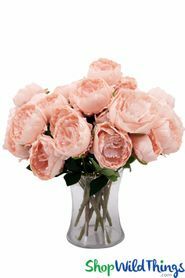 Using Silk Rose Buds, create a logo, monogram or an emblem to represent your event. Alternate with white flower walls for a textured checkerboard pattern. If you want to create a design with other materials you can easily part the flowers and use the grid to attach items. Design a starry sky by suspending the mat with magnet hooks and intertwine �cool to the touch" Fairy String Lights or hang Firefly Pearls and starburst ornaments! This mat is an ideal size to use on drop ceilings with metal grids. Mirror Garlands and Sparkling Crystal Strands add another layer of glam. If you need a wall that will be seen from both sides, use the easily accessible grids and tie 2 mats back-to-back. You can even cut the plastic grid frame to make creative shapes. The most critical point is to make sure that each wall panel is secured in multiple spots, not only to the pipes but to each adjoining panel as well. The tie should be a material that won't relax or stretch like burlap twine, wire ties or zip ties. When displaying multiple panels next to each other, each wall needs to be pulled taut so the seams don't show. The flowers extend over the frame, hiding the pipes while creating a seamless look.